Well this week was the latest Doctor Who sale at Bonhams, and on Sunday I went along to the viewing. The write-up below features the Tenth Doctor items, and I have written about the other Doctor eras under the appropriate blog. I had arranged to meet a couple of friends, who had been to visit me a few weeks back so I could pattern trace their screen-used Colin Baker Costume. They were at the auction with the serious intention of bidding on some items. I won’t divulge what, as that would be telling, but suffice to say it does not clash with anything I have my own eye on! Phew! The main thing I wanted to have a look at were the Doctor’s ties, which were in a glass display case (see right), just along from Sylvester McCoy’s hat with hatbands, something else I have my eye on. Below this were the ties including the TimeLord tie that Magnoli has copied – twice now! Knowing the tie was there I took advantage of the opportunity to compare and see how close the copies were. 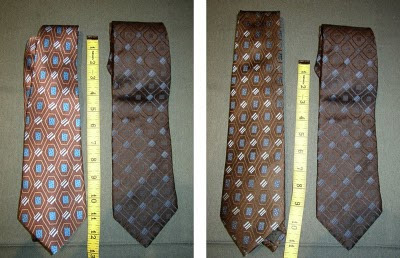 Firstly the original printed tie, which although a good effort, is clearly very off from the real thing (see below, left). Then I compared the latest version Magnoli has done, which is woven rather than printed. It is a much better tie and has a more accurate feel . . . or so I thought (see above, right). For when I put it side-by-side I found, even to my own surprise, that it left a fair bit to be desired. The original has a chain-link fence pattern in diamond shaped squares; whereas the copy is distinctly in hexagons with the detail design at the cross points not matching at all (see right). I must say I was a tad disappointed, as I always felt this latest draft of the Magnoli tie was a vast improvement on the original. I am guessing he had limited source material to work from, so had made the very best job he could. That said, it is still a very good tie. Elsewhere around the room were most of the costume-based lots, with the original series on one side and the new series on the other. I was in two minds about the new series stuff, as the majority of it was simply of-the-peg high street bought clothing, so not really that special. It was nice to see some of the more iconic New Series items close up for a change, such as the Jackson Lake Next Doctor costume (see left), which was a very nicely made frock coat in a bold tweed pattern. I also noticed, somehow only for the first time, that the pattern of the fabric is very skillfully matched across the chest to the sleeves, as well as over some of the seams of the body. That said, one thing I did spot was the buttonholes on the coat, all of which were just surface decoration and did not go through to the underside of the coat, so could not be used as practical fastenings! I guess sometimes things are just done for show and their visual look. The fabric for the waistcoat was nonetheless very nice to see first hand (see right). It would be interesting to track down where the fabrics came from. The vast majority of the New Series items were from Rose Tyler’s wardrobe, and all this was housed on clothes racks in a corner of the room, so were only viewable on request – something I was happy to pass on for now! Some items were on mannequins and included David Tennant’s dinner suit and Kylie’s dress from Voyage Of The Damned, as well as Donna’s leather coat from series four (see below). There were no aliens or monsters on offer in this auction, and only a couple of props, such as a massive speaker form The Runaway Bride. Looking through the catalogue it’s been a general opinion that the estimates are way below what they should be, and that many of these items will sell for considerably more. As ever, we shall see . . . .
Nice to see it close up! If still had any spare cash lingering around after your coat I would have gone straight for those ties in a heartbeat! Who knows, maybe in another big bunch of years they will be sold on :). Especially if an exhibition takes them on!